runs as Kenya Cup rugby league enters the fourth round on Saturday across the country. The three sides have been on a cruise, winning all their three previous matches with the bankers and Homeboyz winning with bonus points for their tally of 15 points each. Curtis Olago’s KCB target to pick from where they left from last Saturday where they handed Kenyatta University’s Blak Blad their first defeat of the season, 70-16, with an equally emphatic win against wounded Nakuru at Nakuru Athletic Club. The bankers opened their season with victories against Strathmore Leos (27-0) and Kisii (33-6), and could be staring at their fourth consecutive bonus point victory. Nakuru, the 2013 and 2014 Kenya Cup champions, seem to have lost their bearing after welcoming Kisii with a thud, 45-15. They later crushed to Kenya Harlequin 46-19 and 2016 champions Kabras Sugar 30-6. Homeboyz, who are second in the league, have so far claimed two crucial victories from their three outings, beating Quins and Impala Saracens 41-39 and 39-21, respectively, besides edging out Nondescripts 29-21 in a duel that doubled up for Andree Wekesa Memorial Cup. The “deejays” take the battle to Kisii’s doorsteps in Gusii where they are tipped for another bonus point victory unless the home side are to pull another spirited battle like the one that saw them hold KCB before crumbling 33-6. Kabras, under their new coach Charles Cardovillis, have been streaking, beating Mwamba 29-22, Strathmore Leos 44-13 and Nakuru 30-6. The sugar millers are quite certain of victory against hosts Mombasa, who are seeking first win of the season. Quins bounced back from their opening 39-41 loss to Homeboyz, posting two massive back-to-back wins against Nakuru (46-19) and Mwamba (48-16). They play away to to Blak Blad at the RFUEA ground while winless sides Strathmore Leos and Mwamba will battle at the student’s home ground in Madaraka. 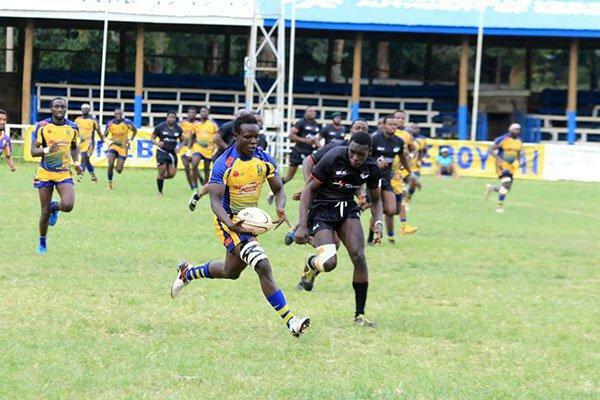 Impala Saracens hope to recover from their defeat to Homeboyz on Saturday when they host Nondies, who are out to uphold their moment after claiming their first win of the season, beating Mombasa 64-5. Mombasa v Kabras Sugar (Mombasa Sports Club), Nakuru v KCB (Nakuru Athletic Club), Impala Saracens v Nondescripts (Impala Club), Strathmore Leos v Mwamba (Madaraka), Blak Blad v SportPesa Quins (RFUEA), Kisii v Homeboyz (Gusii Stadium).